On a steamy August night in a dark space bursting with Brooklynites and other humans, a DJ steps to the decks. It’s the third installation of the Lights Out series at the Knitting Factory, and Detox Unit is about to blow minds. Ascending into the corner of the room, Joe Roberts knows what’s cranking inside the spanking Hennessy Sound System before him. He knows forwards and backwards the material he’s prepared - detailed, meticulous, dirty, and deep. He knows when the music meets the medium, sound speeding through wire and circuitry, he’ll ignite the sell-out crowd like a tinderbox. Detox Unit is returning to New York City this Friday, November 10th to headline the anticipated Sauce Sessions at Sunnyvale in Brooklyn, a new series of shows conceived by the The Saucy Monster. Joe Roberts a.k.a. Detox Unit actually grew up just north of the city in Scarsdale, NY before moving to Austin, TX in 2013. “I really miss the snow, proper bagels, great Chinese takeout everywhere, as well as the urban sprawl of NYC, but the scene here is rad,” says Joe, who was generous enough to speak with The Rust amidst a hectic schedule of shows from Portland, Oregon to Miami to West Virginia. “I think Detox Unit is easily the breakout artist of 2017,” says Kyle Miller a.k.a. The Saucy Monster. “Dude’s been on a steady path of destruction, releasing all original mixtapes while simultaneously touring across the country.” Kyle is a photographer and producer (Indobeats). As the gracious host and founder of Sauce Sessions, he’ll be seeing Detox throw down for the first time on Friday. Many in the community got their first taste of Detox at Tipper & Friends (T&F) events, which have been a modest launching pad for Joe and a handful of other artists. In 2016, the community left the gathering at Spirit of Suwannee Music Park in Florida mad for Jade Cicada. This year, Detox Unit were the words on everyone’s lips. 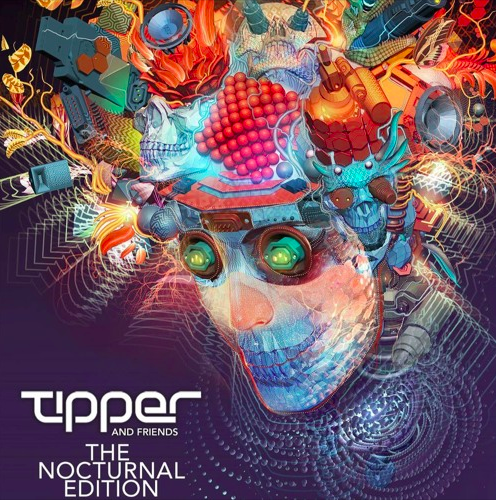 “In the summer of 2016, I got a message to my artist page on Facebook from Tipper's manager along the lines of ‘You doing anything in October?’.” Joe's first T&F performance transpired during the October, 2016 Denver get-down. “Needless to say, I proceeded to freak out and run around the room, then did my best to respond in a calm and collected manner. Tipper's music has been a huge influence on me." Some said they enjoyed Detox more than the headliner himself at Suwannee this Spring. This may be a minority opinion, but among the Spanish moss dripping thick with humidity Detox made his name known. "I began producing music in 2012, initially with a program called Reason but then I switched to Ableton Live. The early stuff was pretty abstract, ... kinda beat-less stuttered out sequences of odd synth sounds. In 2014 I dropped all other pursuits and put my focus on music. Haven't looked back since. Joe is an audio engineer with a sophisticated home studio that includes modular and analog synthesizers, keyboards, old-school effects units, a controlled mess of circuitry, and a separate room for mixing. While some individuals including the author are driven to madness by the slightest technical difficulty, since childhood Joe has derived satisfaction from fixing and tinkering with electronics. Detox Unit music is mental and physical. Glitches woven into intricate patterns twist the mind in comfy little knots, while thunderous but carefully placed bass vibrates the room and everyone in it. Space is key. Empty space in his mix casts sounds into dramatic relief, sharpening their edges and drawing acute attention to every noise. Brief pauses give greater force to the fusillades of bass that follow, and the details of sound design which can be so easily missed become the center of attention within Detox Unit music. It's rare to be intellectually engaged by music while simultaneously getting down, but this is what Detox can deliver. Friday at Sunnyvale the dance floor will indeed be set in wild motion, but not just by Detox. Supporting him is the rising Rust artist MALAKAI along withgifted instrumentalist and producer 5AM, and local low-end lurker Yakooza who’ll spin back-to-back with a special guest. If you’ve never seen Detox Unit perform, prepare for an immersive experience. Check out any of his Recent Works mixes, his latest EP SubPlatter Splatter, or his set from Tipper & Friends Suwannee.